“It was India which invented the bow & arrow” my Dad blustered over the phone from Bombay, “remember Arjuna’s skill at archery? How he could concentrate till he saw nothing else but the target and shoot it with unerring precision time after time….” He had just returned from seeing the Hunger Games at his local multiplex, when my weekly Sunday phone call had sparked off this conversation; with him insisting that the cross-bow was an Indian invention. “Uh! Dad” I protested, “not everything in science fiction comes from Indian mythology….” I was, as usual, embarrassed by his well known theme of India shining and claiming ownership of emerging trends. Yet his comment gave me pause for thought. I began to wonder if he had a point? 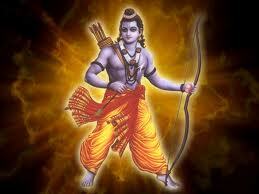 Rama with his bow from centuries ago!